A black silk faille 'balloon' cocktail dress. 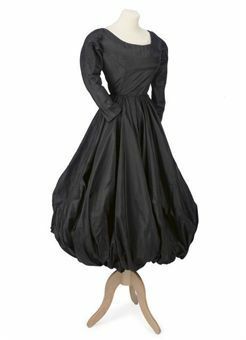 Eisa, circa 1950.
the bodice with wide neckline and bracelet-length sleeves, the very full skirts constructed as harem pants and tightly gathered at the legs to create a balloon effect. Labelled: Eisa. Notes: The culotte type skirts are most unusual. One can only assume this was a modification requested by Mrs Biddle. Commentaires sur A black silk faille 'balloon' cocktail dress. Eisa, circa 1950.